Online shopping is very popular nowadays. Unlike before when people are very hesitant to purchase online, fearing they will be scammed. Now, there are a lot of people who use this method because of its convenience. I barely shop online because I don’t have the patience and I want to get my hands on the products I want to purchase ASAP. Haha! But due to convenience and availability of products that can only be purchased online, I have no choice but to proceed — purchase and wait. Happy Skin recently launched a limited edition strobing kit and I’m getting the ‘itch’ to try it (Will post a review about it soon!) It’s not available in any physical stores yet until February 18, but they can be purchased at Zalora from February 10 to 17. Zalora Philippines is one of the known online store in our country that sells Shoes, Fashion, Beauty Products & Accessories. 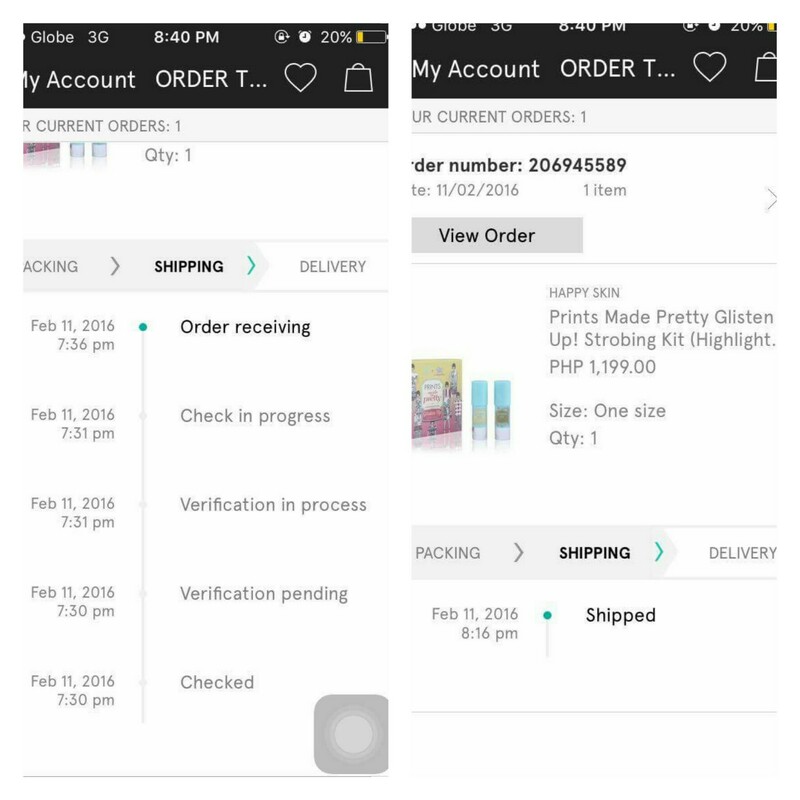 I, then went ahead and placed my order at Zalora on the evening of February 11. When I went to the website using my phone, it prompted me to download the app to get a 15% off on purchases above P1,000. I did download the app but when I was about to checkout, it says that the voucher cannot be applied to beauty purchases. Sadlife. I still went ahead and placed my order, though. I was very excited I kept on checking the tracking details once the order has been confirmed. The app was also user-friendly and I had no problems with it. A few minutes later, the order was already confirmed and to my suprise; Shipped! I immediately received a tracking number to check upon the whereabouts of my order. I love how updated and specific their tracking information is. Notice the timeline of my order status? So fast-paced! On Februray 12, the status of my order was already on their warehouse and was already in delivery! 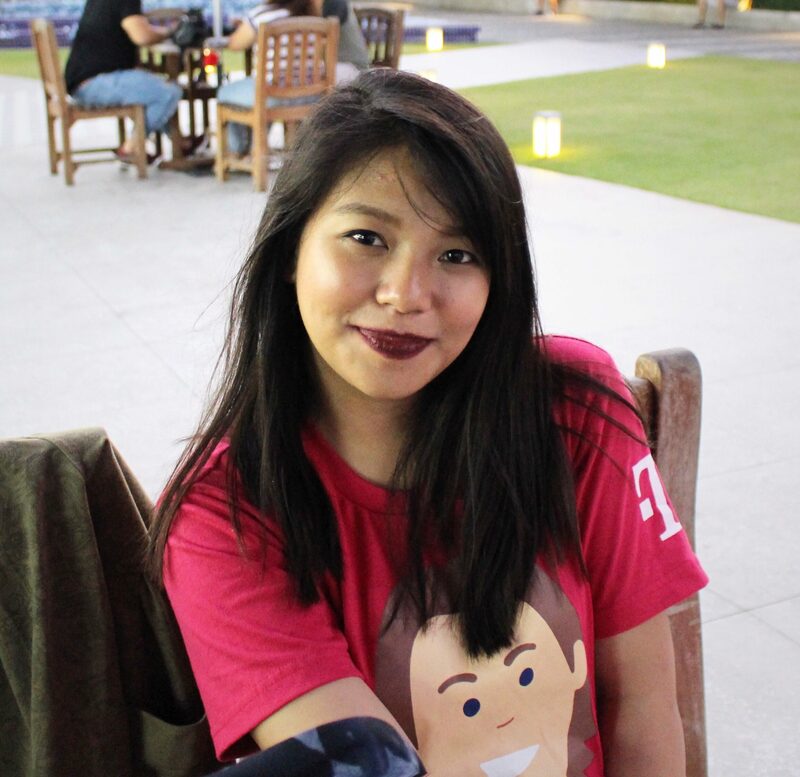 I was surprised because their estimated turnaround-time for delivery in Metro Manila is 1-3 business days. Unfortunately, I haven’t received any message or call from them that day. At the end of the day, the order was back at the hub again. I was worried because it’s difficult to locate our area and the rider might have tried to deliver but was unable to locate us. I sent an email to their customer service and decided to call them the next day. 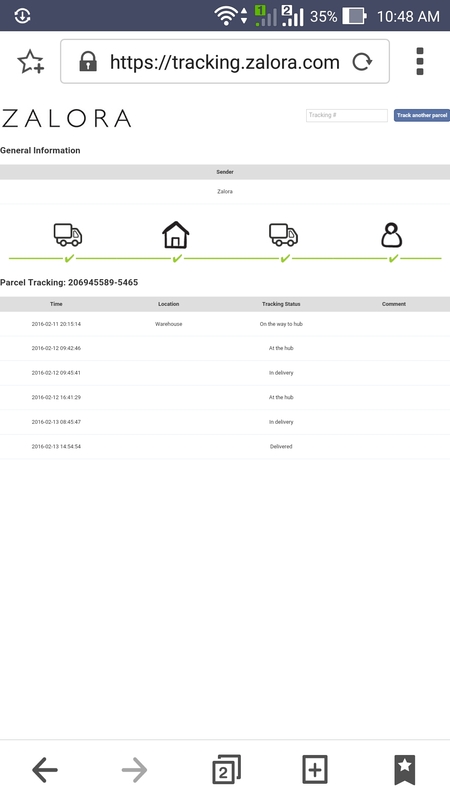 This is how their tracking tool looks like. I was worried because February 13 is Saturday and I’m afraid they may not deliver during the weekends. I lost hope but kept on hoping I’ll receive it on that day. When we were about to call Customer Service, we received a text message from the rider that he is already on his way! Yehey! I immediately sent him a text message with my boyfriend’s name since he will receive the package for me. As per him, the rider was very kind and made small talk with him before he left. I was very happy because I got the product in 2 days! Also, the package was very lovely and it includes a printed version of my name to make it more personalized. When I went to check my email, I received a response from my earlier message that there was an issue with the system that’s why it stated that it was already out for delivery on the 12th but assured me that it is already on its way on the 13th. Overall, I am very satisfied with Zalora’s service. I might purchase from them again soon. Maybe, the Beauty Blender. HAHA. Have you tried purchasing from them? Let me know about it! You may visit Zalora Philippines at http://www.zalora.com.ph/ or visit their Facebook Page. Gosh! Another website to include to the list! There seems to be so many wonderful places that we can purchase items from these days it’s difficult to keep track! I’m so glad to hear it was a positive experience; there is nothing worse than when our purchases go astray. Havent tried Zalora yet. Perhaps in the near future or when the need arises. I still enjoy buying in a physical store and I love trying some of the products on my skin. I have quite sensitive skin so I make sure what I put on it. Perhaps when I am a loyal user of that product, I could do my purchase via Zalora. Thanks for this. I do a lot of shopping online as I can’t be bothered to go to the shops and face the crowds. I do not live in the Philippines so I never heard of the website you are reviewing before but you seem to be happy with the process of ordering. It’s always important to know when you will receive the products you order and for them to arrive on time. This sounds like a great app, one of my favorite online apps that has a similar setup is SheIn, they have great prices and beautiful pieces! Perhaps you would like them too? Online shopping is taking off finally, but still in infancy stage in the Philippines. Zalora, I know about but they do not sell products I personally need. But they are among the better online shopping sites here. Never heard of zamora. Maybe I’ll search their site and see if they ship to the US! Haha! I love online shopping, buy I also understand wanting your items same day! How was the strobing kit? I know strobing is a big trend but I just can’t get into it. Finally a positive story , I was already like … oh , no another nightmare … Fantastic , that people share as well great experiences . You will have a laugh now , but I have never ordered anything online in my life . Might be due to my destination , on an island , import taxes can kill the good price , it can get quite complicated , and I rather avoid that . In may own opinion, I’ll go with Zalora. 🙂 They offer quality items and has great service.